When the South Korean fast ferry Hankyoreh sailed out of North Korean waters into the cold wind and waves of the East Sea on the morning of 8 January 2006, it carried a sad and somber group of South Korean workers, ROK officials, and personnel from the Korean Peninsula Energy Development Organization (KEDO). These were all that remained of a decade long multinational effort transforming what in 1994 had been only a paper notion into a modern construction complex of steel and concrete. KEDO’s profile on the North Korean landscape was unmistakable, its impact on Pyongyang profound. Yet, real knowledge and understanding about the organization in public and official circles in South Korea, Japan, and the United States was terribly thin at the beginning, and remains so to this day. In a new 38 North interview, “Reflections on KEDO,” Joel Wit (38 North founder and Visiting Scholar at the US-Korea Institute at SAIS), hosts a conversation with Ambassador Stephen Bosworth (former US Special Representative for North Korea Policy and current Dean of The Fletcher School at Tufts University) and Robert Carlin (CISAC Visiting Scholar), about their experiences with KEDO. All three were involved with KEDO at different times in its ten year history and provide insights into what it was like on the ground building this multilateral organization. They discuss some of the major challenges in dealing with the North Koreans, as well as the cultural learning curve faced by KEDO’s multicultural staff. From the perspective of direct experience, they examine both KEDO’s accomplishments and the opportunities missed by the organization’s abrupt termination. 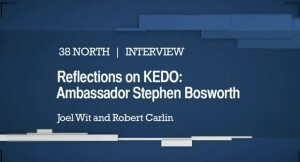 In the final segment, Ambassador Bosworth also reflects on the Obama administration’s North Korea policy and provides his views on how to improve relations with the North in the future. Watch the video below or on our YouTube Channel 38northNK. Or download the transcript. The 38 North video series is generously supported by the Carnegie Corporation and the US-Korea Institute at SAIS. Charles Kartman, Robert Carlin, and Joel Wit, A History of KEDO 1994-2006 (Center for International Security and Cooperation: Freeman Spogli Institute for International Studies, Stanford University, 2012), 5, http://cisac.stanford.edu/publications/a_history_of_kedo_19942006/.